The notification system sends messages via http of new events1 that have taken place on your merchant account. A message is created in XML and sent to a user configurable URL. The notification data can then be used to call the API and retrieve specific information, such as the details of a new order. The API notifications are sent reliably, meaning that the message will be retried until a http response 200/OK is received from your notification url. Please note that the time between each attempt will be doubled, for example, first attempt immediately, second attempt at 1 minute, third attempt at 2 minutes, fourth attempt at 4 minutes etc. The following diagram shows the typical flow of data when the API sends a new event notification. 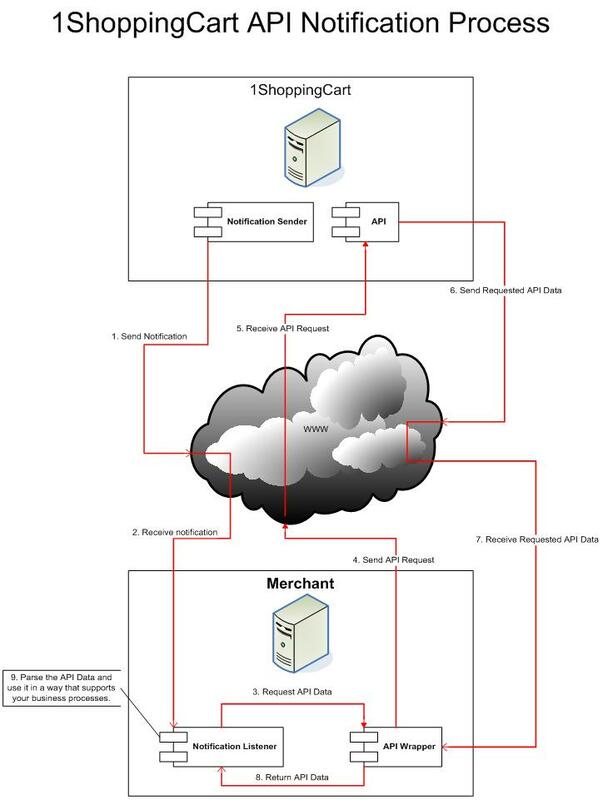 The API will parse out the merchant id, merchant key and token value from the request and prepare the requested data. Add functionality to support your business processes. for example you can parse the ShippingInfo node and prepare shipping labels. A Test Notification is sent when a you call the Test Notification API Method. Use this feature to verify that your Notification Listener is functional. New Order Notification is sent when a new order has been placed for your merchant account.